The number of Brazilians using the Internet has increased dramatically since 2000. Internet access remains predominantly in developed, urban areas, where Internet cafes — frequented mainly by Brazilians from lower socioeconomic groups — “connect” nearly half of all users. Brazilian users most frequently access social media, especially social networking sites (SNS) like Orkut, a Google-owned site comparable to Facebook, and Twitter. Facebook has tried to challenge Orkut’s market dominance, with mixed results. Blogging is also a popular form of Internet communication, while YouTube is the most widely used video website. Internet penetration, a measure of a population’s overall Internet use, and personal computer ownership have grown rapidly in Brazil over the last decade, but both rates remain relatively low compared to those in developed nations. Although the number of personal computers has risen, Internet cafes — or LAN (Local Area Network) houses, as they are called in Brazil — remain a vital means of Internet access for Brazil’s large, underprivileged population. According to the digital marketing intelligence company comScore, there are about 73 million Internet users in Brazil, or about 37% of the population (Cited by Teleco, May 2010; Internet World Stats, 31 December 2009). This represents a dramatic increase since 2000, when Internet penetration was only 3%. Household Internet access increased from 20% in 2008 to 27% in 2009 (NIC, 6 April 2009). [ 3] Sixty-six percent of household Internet access is through broadband connections (NIC, 6 April 2009). computer ownership (NIC, 6 April 2009). LAN houses are popular Internet access points, primarily located in “favelas,” the poorest urban areas (Publius Project, 21 September 2009; BBC Brasil, 17 March). These sites provide Internet access to more than 45% of “connected” Brazilians and up to 60% in impoverished areas, according to government data (IDRC, 30 April 2009; CETIC, September/November 2009). Brazilians are among the world’s most active SNS users. Orkut dominates the Brazilian SNS market, but rival Facebook has made some minor inroads. Ibope Intelligence, the Brazilian Institute of Public Opinion and Statistics, reported that Brazilians boast the 10th highest worldwide average of SNS users (Folha de Sao Paulo and O Globo, 23 July). Nearly 60% of Brazilian Internet users actively visit SNSs, while Ibope indicates that 20% more of those surveyed plan to access an SNS “in the near future” (Global Web Index; Folha de Sao Paulo and O Globo, 23 July). Orkut is Brazil’s most popular social network (O Globo, 9 July). Over 20 million Brazilians use Orkut, constituting 50% of Orkut users worldwide (Advertising Age, 14 June; Orkut, 30 June). 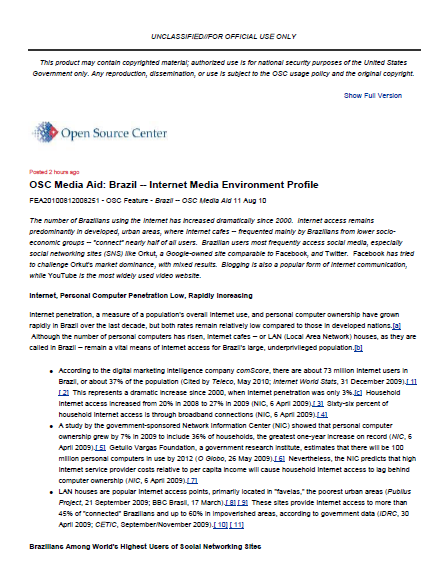 The site is so popular that some emerging media analysts claim that it “played a fundamental role in popularizing the Internet in Brazil” (DMLcentral, 13 November 2009). Although Facebook activity in Brazil increased by 66% between January and June 2009, the site still has only about five million Brazilian users (IDG Now, 4 August 2009; Inside Facebook, 14 July). Facebook’s creator announced that Brazil was one of the next candidates to have official company representation, according to local press reports (Folha de Sao Paulo and O Estado de Sao Paulo, 4 August 2009).